A very imposing pinnacle of rock. On many occasions it still manages to pierce the notorious West Coast cloud (something of a redeeming quality). It is by far the best climb east of Arthur’s Pass. Approached from Good Luck Creek via the Deception River, alternatively via the denesly wooded spur that leaves the Deception River at K33 974151, on the true left of the stream that drains the Franklin-Russell escarpment. This ridge is notoriously long and loose, and has multiple gendarmes. Once committed to this route, there are no escape routes, however travel tends to be fast over large sections of it. Considered a mid spring climb when ice clings to it. Normally climbed via the Good Luck Creek basin by the West Ridge, or from the col above Lake Anna via the steep South Face and South Ridge (an excellent route). The West Ridge can be dangerously corniced under winter conditions, making it extremely hard to negotiate. To reach the basin, ascend the slide upstream of Upper Deception Hut to the scrub line, then sidle into the head of the creek. Ascended from opposite Goat Pass Hut utilising the obvious deep gully and notch. A generally straightforward ascent joins the col above Lake Anna, then climbs the steep South Ridge to the summit. This route can be climbed in winter to late spring by reaching the head of the Deception River from Goat Pass Hut. Scree or snow slopes head through the lower bluff to reach the steep snowfield (avalanche danger!) below the 1975m South West Ridge rocks. In a normal season three 150m couloirs gain the South West Ridge. 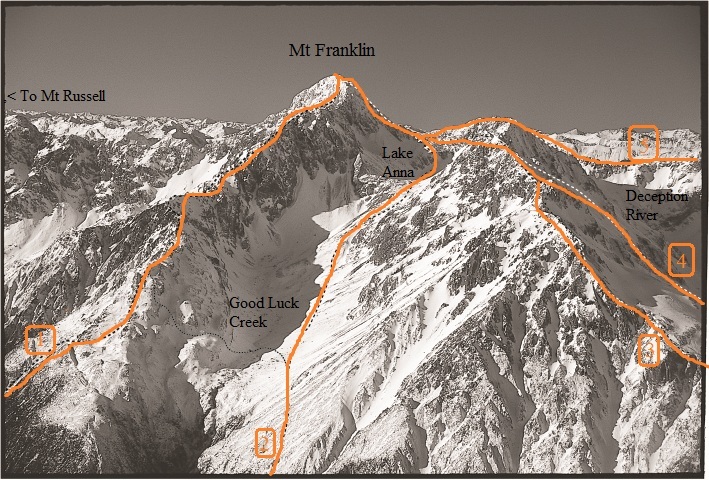 Alternatively, gain the ridge lower down by utilising the obvious deep gully and notch directly opposite Goat Pass Hut. Continue along the ridge to gain the col separating Lakes Anna and Sally. Ascend the steep South Ridge to the summit. Return via the Deception River route (2). This ridge is a very long journey from Goat Pass and would be better tackled from a camp near Lake Mavis. Gain the ridge along the Main Range above the lake, following its initially broad back to the second knoll (1864m). From here the ridge narrows, taking a steep approach to the summit of the next buttress (1876m). The ridge turns west over the exposed slabs above Lake Sally and the deep gut of the upper Deception, climbing steeply over broken ground to join the South West Ridge. From here descend to the col above Lake Anna then climb the steep South Ridge to the summit. Be well prepared for a forced bivvy as it is a very long day’s outing!